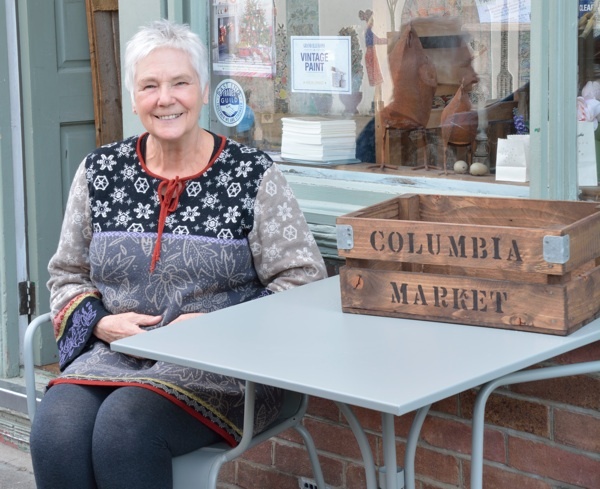 It is my great pleasure to introduce the first of seven stories about the culture and history of Columbia Rd by Linda Wilkinson, the distinguished historian of Columbia Rd. 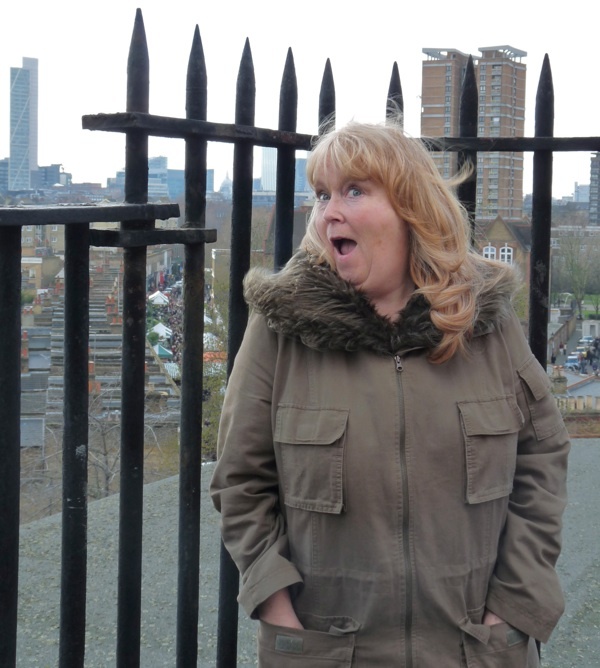 Linda is author of Watercress But No Sandwiches: 300 Years of the Columbia Rd Area & Columbia Rd – a Strange Kind of Paradise, and her family have lived in the East End for more than four centuries. Thus I leave you in Linda’s safe hands while I take a rest until my return on Monday November 17th. It is hard to believe that when I first returned to Bethnal Green in 1986, taxi drivers would not enter Columbia Rd after dark. In those days, work colleagues and friends, almost universally, had no idea where it was – assuming that, with “Green” in the title, it was somewhere way out in Essex or near Wood Green. By then, I been out of the area for twelve years so the fact that nobody knew where it was came as no surprise. Bethnal Green had always been a hidden place – a place where, at some points in history, the Police simply would not venture. The taxi situation though was new. Cabs and cabbies had been a way of life. Many cabbies, even today, declare their Bethnal Green roots, sometimes a little ad nauseam, truth be told. What had changed? In short, the old demographic had shifted. 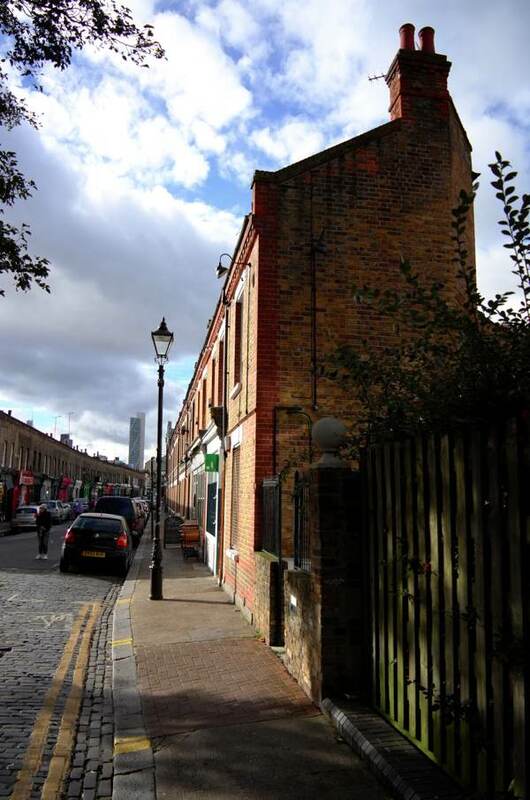 The trading street that was Columbia Rd had gone. It was no longer a place of butchers, grocery stores, greengrocers, haberdashers and boot menders, and much of it was boarded up. A few traditional shops were hanging on – the newsagents, chemist shop and the fabulous Lee’s Seafoods were all that were left of a once-vibrant street. At night there was no life, it was as desolate as a desert. The nadir of that period did not last long, however. If nature abhors a vacuum, London does even more so. Cheap rents brought in a new band of people who have renewed and reinvigorated not only Columbia Rd, but East London in general. 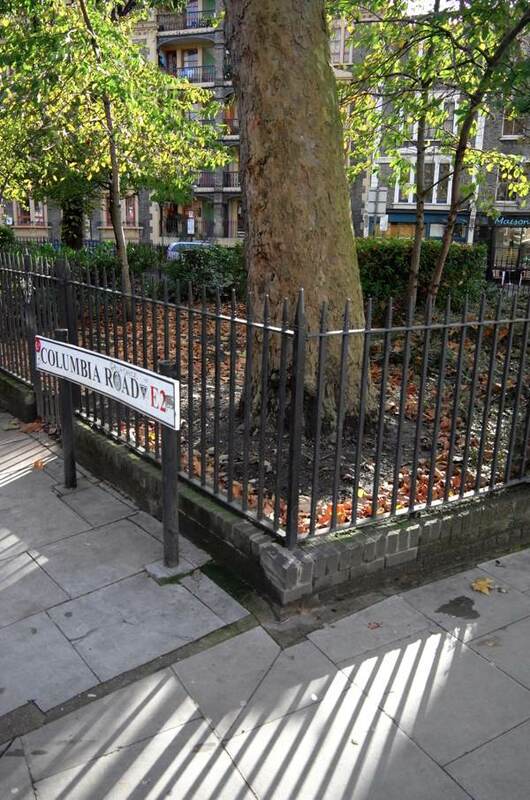 Although I was born in the now-defunct Bethnal Green Hospital, I was really hatched on Columbia Rd. Over the years, I moved from being a scientist to a playwright and a local historian. In tandem with research into my most recent book, Columbia Rd – A Strange Kind of Paradise, I looked into my family history. I suppose it should have come as no surprise that we have been in the area for some years. I had returned to live just around the corner from where I was born for a reason. For years something had been missing from my life, a sense of place. It turns out that my father’s family have been in the immediate area for around one hundred and fifty years. I have traced parts of my family back to Wapping in the sixteen-hundreds to a shipwright called John Homan, who built and repaired the small boats that plied the Thames. At Christmas 1985, I came with Australian friends to the Flower Market. I had not been back since my parents had left the area some years before. I recall sitting in the Royal Oak Pub and being in tears. I knew then that I had to come home. As much as the past informs the present, my stories this week are going to be about the glorious and eclectic nature of my part of the East End both then and now. The empty shops and desolate thoroughfare have gone. People with vision and drive brought forth that change. I like to call them pioneers because, back in the seventies and eighties, east of Liverpool St was still a foreign land to most. Dangerous, dark and dingy but to those of us who knew it – it truly was a strange kind of paradise. 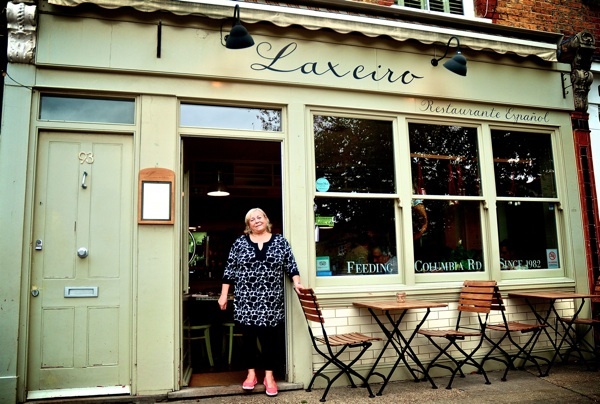 Isabel Rios has been feeding Columbia Rd since 1982. Originally from Galicia in Northern Spain, she took over the shop from the Davis family who had run the local dairy for many years. At first, Isabel ran it as a delicatessen, but moved on to opening a Tapas bar and then the restaurant Laxeiro which we know today. Angela Flanders arrived on the street in 1984 with her daughter Kate Evans, several cats and a tortoise. She moved from working on decorative paint finishes to drying flowers and making pot pourri. 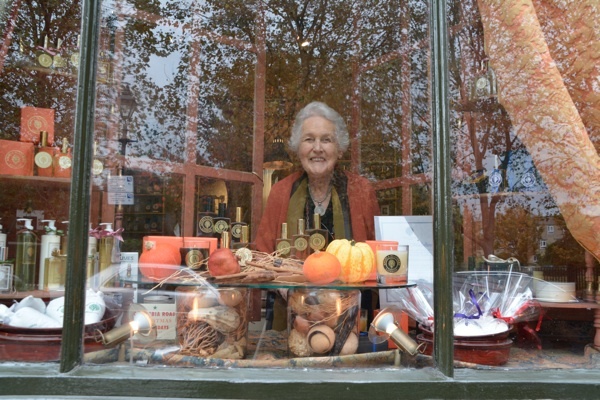 She is now a renown perfumer who still works from her original shop in Columbia Rd and has recently acquired a second outpost in Artillery Passage, Spitalfields. Penny has lived in the area since 1984 when she was a teacher. In the late eighties, she decided to branch out and create The Garden Shop which sells unusual decorative goods for home and garden. Jackie Bryant is not quite on Columbia Rd, but she is an institution in her own right. She came from Hoxton in the eighties to settle on the Jesus Hospital Estate. She is our dog walker and pet carer extraordinaire, and a great friend to two legged and four legged creatures alike. For many years, the family at Lees Seafood supplied the area with fish, particularly the shellfish beloved of East Enders. This photograph from the eighties shows how popular it used to be. Nick Smith was an antiques buyer for Liberty of London and has been selling interesting furniture at number 116 since 1986. He believes that those people who arrived in the eighties were visionaries who chose to express their creativity in a place that was a cultural desert. 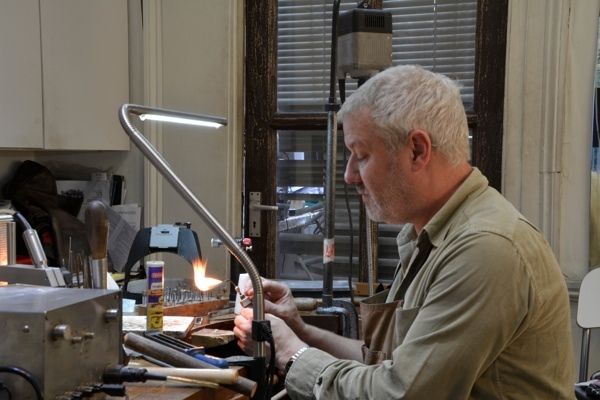 Simon Rees started selling his jewellery in 1993 in the greengrocers at 160 Columbia Rd. 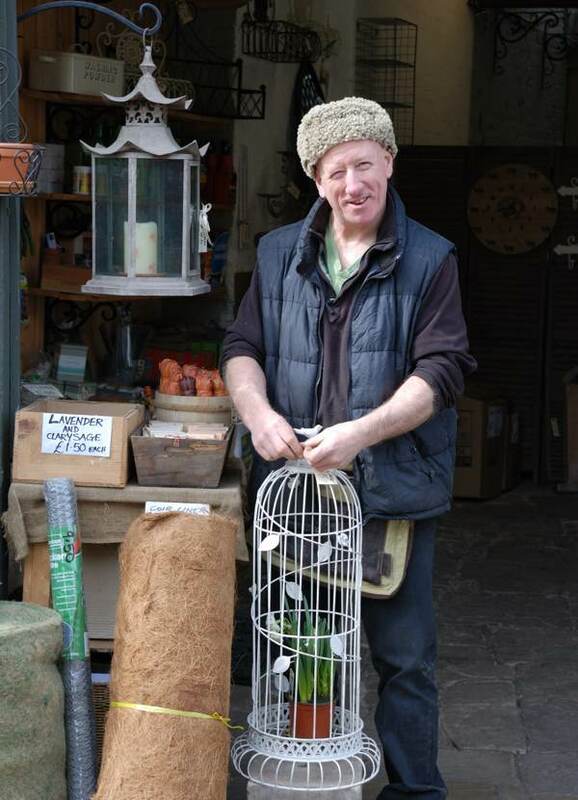 He rented the space on Sunday mornings, and recalls the smell of potatoes and cabbages which accompanied his sales. Today, his workshop and studio are next to Angela Flanders’ shop, and she was instrumental in bringing him and his family to the street. Steve for a goodly while in the eighties and nineties was known as ‘Video Steve’ because he rented films from number 146. Today he has a space from which he sells World Maps at the back of that same shop. 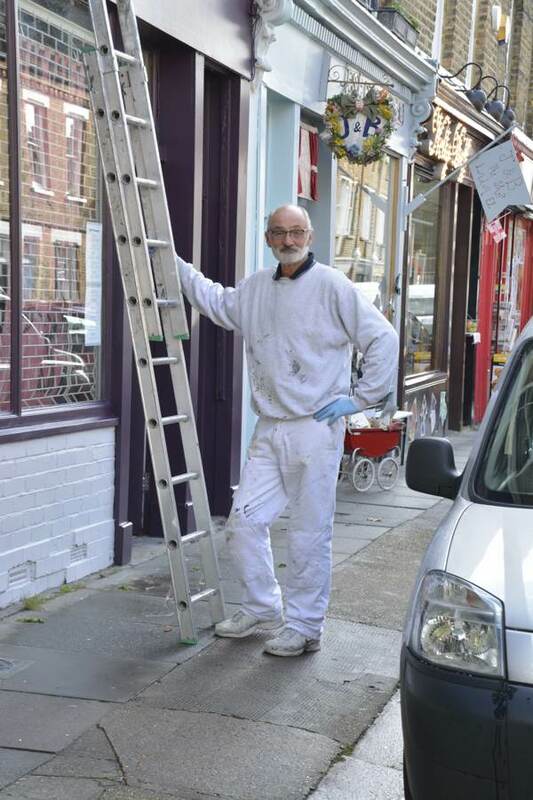 Like Jackie, he is a stalwart of Columbia Rd, and also decorates and renovates the ageing buildings in which we live with love and care. Linda will be talking about her books at The Write Idea Festival on Sunday November 16th at 4 pm at the Whitechapel Idea Store. I remember with great fondness my good friend the ceramicist Idonia Van Der Bijl who also trail blazed with an establishment in Columbia Road, and upstairs flat, in the ’80s, later moving to Museum Street. Sadly she died of cancer in her prime. Still have her pots and still think of her from time to time. Lovely story, beautiful people. Good to see how people can make a difference. Looking forward to reading more about Columbia Road. GA, enjoy your time off! What a colorful life in this urban quarter…! 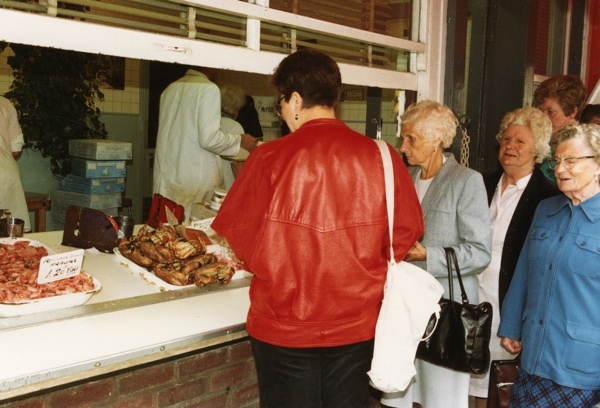 Les and Penny used to sell their lovely wares at St Albans market in the late 90′s!! Like Clive Jennings, I too remember Idonia Van Derby Bijl with much fondness. We both studied at Central School of Art and Design in the early, 80s. I still have some of her wonderful ceramic pieces from those early days. After college I returned to my native Ireland. 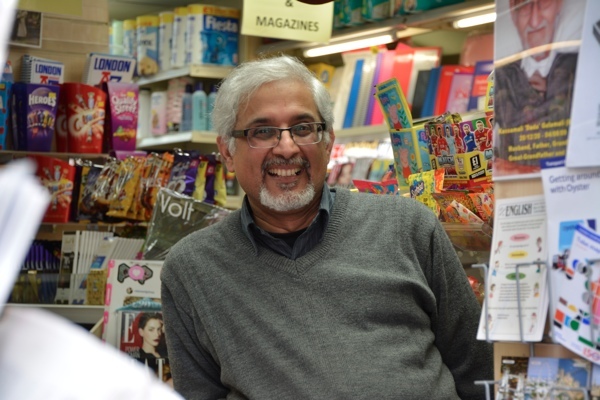 A few years ago I called to the Colombia Road shop and had hoped to catch up with Idonia and the gentleman in the store told me she had passed away. I was so shocked I just turned and left. Idonia is someone who is forever in my mind and this evening I did an online search and found this article and Clive’s posting. What a great loss. May her memory stay in our hearts forever. Idonia was my youngest sister. There were four of us. We miss her hugely and hold on to lots of great memories. Tomorrow is the anniversary of her death 18 years ago. Loved and remembered by many.